What is the Nevada Dispute Resolution Coalition? The Nevada Dispute Resolution Coalition is a non-profit association of mediators/ADR practitioners whose mission is to promote public awareness of processes that encourage collaborative solutions to conflict. NDRC seeks to educate the community about alternative dispute resolution options in our local area and to promote high standards of professionalism for practitioners of alternative dispute resolution. NDRC is proud to present "De-Esclate: How to Calm an Angry Person in 90 Seconds or Less" based on Doug Noll's best selling book! WOULD YOU LIKE TO JOIN NDRC? 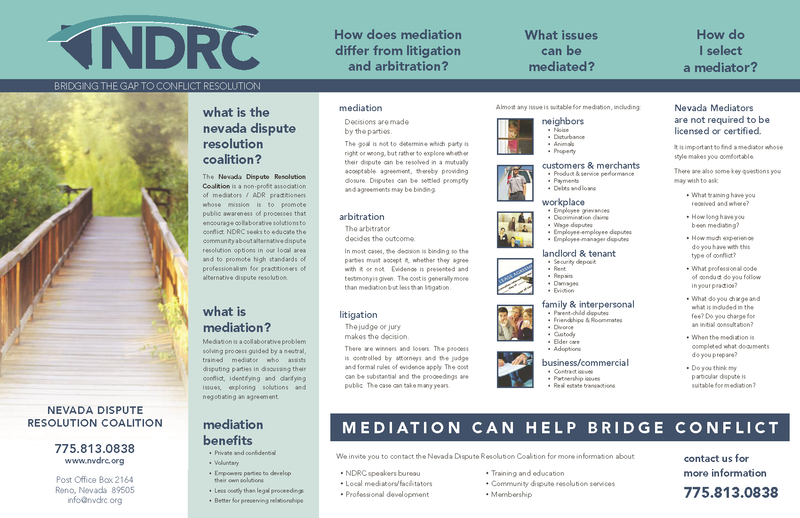 Mediation is a col﻿﻿laborative problem solving process guided by a neutral, trained mediator who assists disputing parties in discussing their conflict, identifying and clarifying issues, exploring solutions and negotiating an agreement. set forth in full on the Disclaimers page of this site.